High Holy Days are a time for reflection, introspection, prayer, and re-connection. We welcome you to join us in celebrating and observing these special Holy days. We offer a variety of services to meet the spiritual needs of our diverse community. Please see the Schedule of Services for a list of dates and times of services and children’s programming. Attendance at Congregation Emeth’s High Holy Days programming is a benefit of membership; we do not issue tickets to our members. Members of other synagogues with a verifying letter from their home synagogue are also welcome at no charge. If you are not a member of Congregation Emeth and not yet ready to make that commitment, you may purchase tickets by contacting our administrator admin@emeth.net. 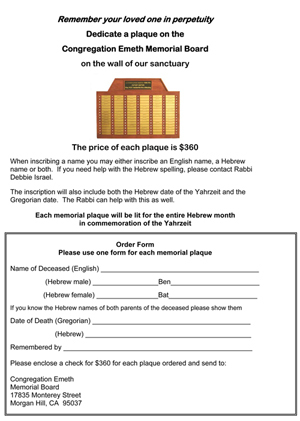 Should you subsequently decide to join Congregation Emeth (before the end of the calendar year), we will apply your ticket costs toward your membership pledge. If you are not affiliated with a synagogue and have never visited Emeth, we welcome you to join us for the Holidays at no charge. We also offer free tickets to students and military personal as well as an extremely affordable special rate for young adults. To take advantage of these waived or reduced rates, you must RSVP to our membership director membership@emeth.net. We look forward to sharing wonderful and meaningful High Holy Days together!